1) So if it’s not a bear… what is it? 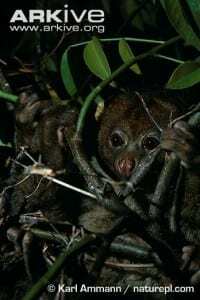 The potto (Perodicticus potto) is a nocturnal, prosimian primate of the family Lorisidae. It lives in the dense rainforest of central Africa from Sierra Leone and south-eastern Guinea to south-western Kenya. There are now four recognised subspecies. 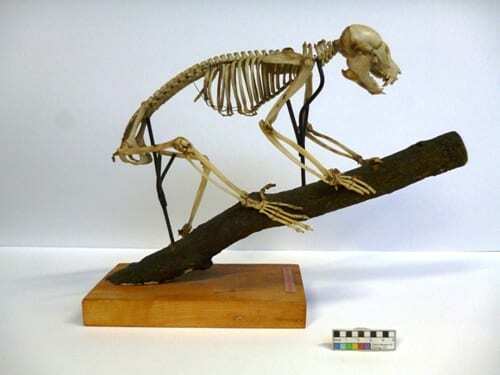 The most recent was identified in 2007 from a single animal collected on Mount Kenya. The adults vary in weight from 600 to 1600g and are covered in woolly fur. This is dark, usually grey or brown, to help them blend into the forest. It also gives them their toy-like appearance and in a previous life as a zookeeper I’ve seen an actual teddy used to provide a lonely potto with a friend. 2) If you go down to the woods today. The potto primarily eats fruit but is also an accomplished insectivore. When ‘hunting’ (they are neither the quickest nor the largest predator) pottos tend to rely on fewer, bigger insects to get them by. They are one of the few primates with confirmed chitinase activity in their gastric mucosa (stomach lining). This enzyme helps them digest exoskeletons, breaking down the large (to a potto) insects. 3) We’re not going on a bear hunt. Surprisingly, for its size and apparent vulnerability, the potto doesn’t seem to get eaten very often. In their case hiding is a successful defence, though as a last resort pottos can also release a noxious, “curry-like” secretion. Despite this, occasional hunting by groups of chimpanzees (Pan troglodytes) has been recorded. This is believed to be culturally isolated, with only a few groups hunting pottos, and is not seen as typical chimpanzee behaviour. It has also been shown that crowned eagles (Stephanoaetus coronatus) eat pottos: sampled eagle poo contained a disproportionate potto content. We don’t know how a daytime hunting bird would achieve this. If we take a look at the skeleton some of the morphological peculiarities of the potto become clear. 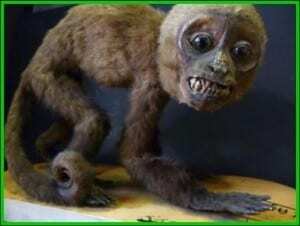 It has a stubby tail which is long for a member of the loris family. And the bones of the neck vertebrae stick up between the shoulder blades, as you can see below. In life it would be covered by particularly sensitive skin and fur. The purpose is obscure. 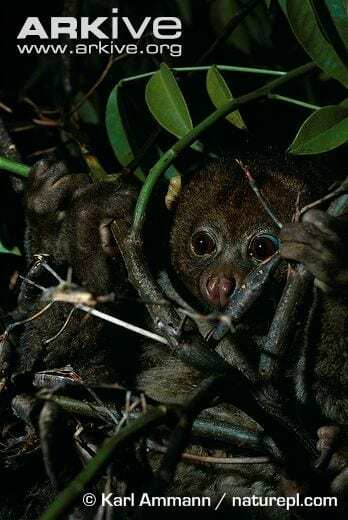 It may be for protection (the potto normally forages with its head down, snuffling along a branch) or it could play a role in social and sexual behaviour. Or both. 5) Actually, it’s monkey business. Male and female pottos look the same and use chemical cues with a few vocalisations to attract mates. They reproduce once a year, though the exact timing varies regionally. There are multiple matings and multiple partners, usually with the couple suspended beneath a branch. Pottos have a very strong grip. 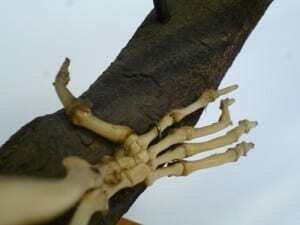 Potto (Perodicticus potto) hind limb. Note the toilet claw on the second digit. Returning to the skeleton, we can see how the potto gets its grip. Specially adapted thumbs and big toes encircle the branch attaching its hands and feet firmly. The first digit on the hands and feet acts opposite the other digits, like four pairs of pliers. 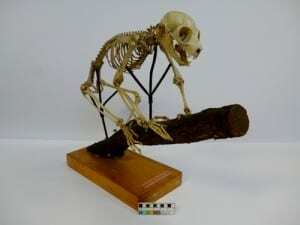 Pottos have more blood vessels in their limbs than we do. This allows blood to flow continually, even when the limb muscles are contracted, which helps them maintain their grip without cramping. Pottos have a “toilet claw”, for grooming, on the second digit of their hind foot. A potto will never forget its comb on the way to a hangout. I hope you can see why I think a lot of the potto. But if notto, just remember the next time you’re in the African rainforest, although they might not grab all (or any of) the limelight, the very thing that makes them forgettable is the reason they are still there. Curled up in a tree. Boesch, C. and Boesch, H., 1989, Hunting behaviour of wild chimpanzees in the Taї national park. American Journal of Physical Anthropology. v78. 547-573. McGraw, W. S. and Berger, L. R., 2013, Raptors and primate evolution. Evolutionary Anthropology: Issues, News, and Reviews. v22. Issue 6. 280–293. Frederick, C. and Fernandes D., 1996, Behavioral changes in pottos (Perodicticus potto): Effects of naturalizing an exhibit. International Journal of Primatology. v17, Issue 3, 389-399. Will Richard is Visitor Services Assistant at the Grant Museum of Zoology.